These brownies look so good! I love the deep red velvet color...they would be perfect for Christmastime. 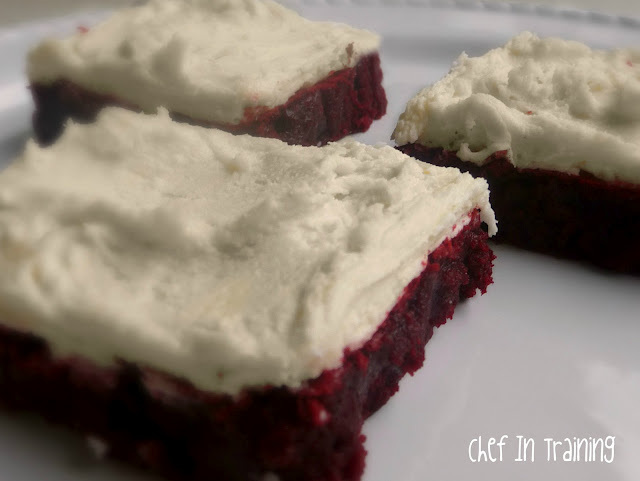 After the barrage of pumpkin recipes in the food blogosphere of late, red velvet brownies sounds divine. I bet my kids would love these. They may get added to my list of weekend cooking projects! Music to my taste buds! Thanks for sharing. This non-baker just may have to tackle these. I just love these brownies too! Seriously maybe my all time favorite dessert! Yours look great! Are these legal? They look divine. I'm all for the 9x13 pan! Feel like grabbing these ... So irresistible! These look so good! I'd love it if you shared them at my party www.projectqueen.orgI'm all linked up!Thank you for hosting. These look yummy!! Can't wait to try them! I love that you pinned the recipe and then made it-good on you! I'm glad it worked out so well. I have posted a pink Pinterest post to honour a very dear friend of mine who passed away this week from breast cancer. This October's pink ribbon campaign is now even more important and poignant than ever before for me. I sure do hope you will come visit and perhaps link up this post to my weekly Pinning party. I think every kid loves brownies! So much cheaper to make your own and I love the smell too! Fun colors! As an old lady, to try and read the recipe in one long paragraph is almost impossible,. It looks really good but I'm not going to fight it. Why can't it be printed out like most recipes? Preheat the oven to 350 degrees F. Butter and flour an 9″x13″ baking pan. In a small bowl, slowly stir together the cocoa powder, food coloring, and 2 tsp vanilla into a thick paste until no lumps of cocoa remain. Set aside. .Remove the bowl from the mixer and stir up the batter with a rubber spatula once or twice just to ensure all of the flour has incorporated from the sides of the bowl and there isn’t anything stuck on the bottom of the bowl. You’ll want one uniformly colored (red) batter. Pour the batter into the prepared pan and bake for 26-30 minutes or until a toothpick comes out clean when inserted into the center of the brownies. Allow brownies to completely cool in the pan on a baking rack, about 45-60 minutes. Frost brownies and Enjoy! To make the frosting: In the bowl of a stand mixer fitted with the paddle attachment, cream butter until soft and fluffy then beat in the vanilla. With the mixer on low speed, slowly add in powdered sugar 1/2 cup at a time; allow the sugar to mix in before adding the next 1/2 cup. Once all of the sugar has been added, beat on medium speed for 30 seconds and scrape down the sides of the bowl. Add in the melted white chocolate and beat on medium speed until incorporated. With the mixer on low, add in heavy cream 1 tbsp at a time and beat at medium speed until the frosting has reached your desired consistency.Enjoy! My daughters favorite dessert. Looks so thick and rich.